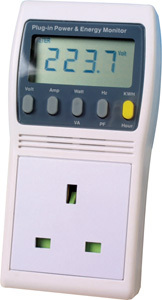 The Kill-A-Watt Electric Usage Monitor (manufactured by P3 International is an essential piece of equipment for anyone interested in saving electricity in the home. While many appliances are marked with wattages, they rarely state how much energy they are wasting when in standby mode. The Kill-a-Watt lets you see exactly where your electricity (and money) is going, and helps you to focus on reducing waste in the home. To use the Kill-a-Watt you simply plug the device into the wall socket, and then plug whatever appliance you are interested in studying into the Kill-a-Watt. The display will then show the current, volts, watts, and frequency etc, and will begin to accumulate data for kWh usage. Knowing how many kWhs you are using will let you calculate how much money you are spending/wasting. The Kill-a-Watt is very easy to use and is portable. 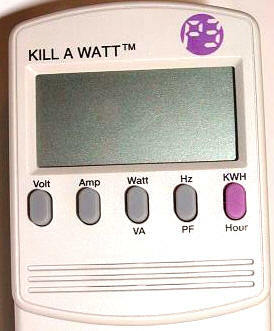 Sadly the the Kill-a-Watt is only available in a 115 Volt or less (North America) version at this time. Finally UK compliant power and energy monitors are now available from the REUK shop. Recommended retail price is around £27, but we have them from around £20 each plus £1.95 First Class P&P. Click here to find out more about our UK kWh Power Meter here.